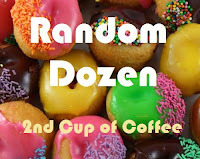 Another fun list from Linda over at 2nd Cup of Coffee. Join the fun - you know you want to! 1. Have you ever been so lost that you were really afraid? I have and it was so not a good feeling... I turned down the radio (I never understood why we do that), and leaned closer into the steering wheel, because somehow that helps?! LOL! Anyway, it ended well. I kept driving and somehow God eventually got me to someplace familiar and from there all was right with the world again! 2. Have you ever been to an island? Yes, I went to Jamaica in 1988 for a wedding and LOVED it. I’ve been trying to get back ever since! I also went to the Bahamas in 1992 (my last real “vacation”) and it was a blast. Next stop - Aruba maybe? I was so born for sun and water. 3. Are you more of a thinker or feeler? Definitely a feeler. I have to just go with the flow most times or I would have “thinked” myself out of so many things that I needed to experience. Not that I don’t use wisdom, I’ve just stopped over thinking every little thing. 4. Do you tend to see issues or situations in life as black and white or shades of gray? My tendency is to see things in black and white, but I’m learning that things are not always so cut and dry. Basically on the essentials it’s black or white; on the non essentials shades of gray are ok.
An endless supply of cranberry juice for starters, a stabucks, a chipotle and a borders… if a place like this really existed you may never hear from me again! 7. Would you rather lose all of your old memories or never be able to make new ones? Wow, that’s a tough one… I think I’d rather lose the old ones only because it would greatly reduce my tendency to relive the past. Instead I would be focused on the new. 8. Pretend I'm looking at a scrapbook page about you. There are three spaces for you to drop in individual pictures. What are those pictures of, and why did you select them? First, I would choose my passport pic from when I was 10 because it shows a determination in my face to make a difference in the world. The girl in that picture had no doubt she was destined for great things. I envy her. I miss her. Second picture would be from my college years - a reminder of how much fun I had and how much better things were that I thought at the time. And the third picture would be the one of the ones I took yesterday, my 44th b-day, because I see traces of that 10 year old in there and that makes me happy. Unlike every normal American woman, I have not pictured my wedding since I was 5 years old… I think it's because I have always know that if I do get married, my wedding is going to be so different from the "norm." That being said, my main thing would be to get input/involvement from the groom because it’s not just my day, it’s "our" day. Also, I would want to incorporate both of our cultures in some way. (I've also always felt my husband will be from another race/culture from me... we'll see). 10. Tell me one thing you know/believe about forgiveness. I know for sure that it doesn’t just free the forgiven, it frees the forgiver who was the real prisoner in the first place. 11. You're waiting in a doctor's office. What is your favorite way to pass that time? Reading… preferably my own book because the magazines are usually so old. 12. If there were a clone of you in a parallel universe what is one way you hope she/he would be the same as you and one way you hope she/he would be better? She would have to have my same sense of humor - that’s a must! I would hope she would be better than me when it came to consistency.